I can hardly believe that I am writing my column for the December issue of Bishopston Voice - 2016 has flown by! I can hardly believe that I am writing my column for the December issue of Bishopston Voice - 2016 has flown by! This time of year is always particularly busy for my family as not only is Christmas approaching but we also have several important family events to celebrate, the most important being my little girl's birthday! This year she will be 6 and we are currently organising her birthday party and busy writing birthday party invitations. 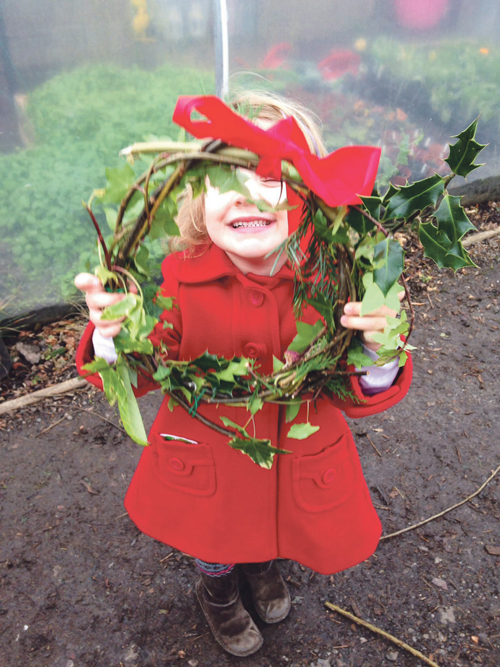 I wanted to tell you about My Wild Child sessions which are held every other Wednesday morning 10 – 11.30am on Horfield Common for families with children aged 2 – 4 years old. My Wild Child sessions are free and teach children about nature and introduce them to a different way of interacting with their local park; all with the aim of inspiring them to do something for nature from a young age. Activities include mud painting, mini beast hunts, making teepees, treasure hunts, wild songs and stories and take-home nature crafts such as bird feeders and seed bombs. My Wild Child sessions are led by a trained forest school practitioner and are organised by Avon Wildlife Trust and funded by the Players of the people’s Postcode Lottery. No booking is required, simply turn up on the day. Sessions run whatever the weather. You can find out more by visiting http://www.avonwildlifetrust.org.uk. As Christmas approaches there are some really lovely family-friendly events coming up in Bishopston and surrounding areas. One of these is the annual Glos Rd Central Street party which will be returning on Thursday 1st December from 5.30 – 8pm and takes place at the mid-section of Gloucester Road at the top of Pigsty Hill, Bishopston. There will be music, food, delicious cakes, Christmas wreath-making and more festive fun. This event also marks the first late night opening for the festive season. Another festive event is a Pop-Up Carols in the Park event on Wednesday 14th December at 6.30 – 7.30pm at St Andrew's Park. Do bring a flask of hot drink, a torch or lantern and your Wellies! I will leave you with one more Christmassy event before I sign off for the last time this year: A Victorian Christmas at Blaise is being held on 3rd December, 11am – 3.30pm at Blaise Castle House Museum in Henbury, one of my family's favourite places to visit. The house will be decorated with boughs of ivy and there will be storytelling and music, plus some festive crafts to enjoy. It's a great way for your children to experience how Christmas was celebrated in Victorian times and what's more it is a free event (donations welcome). If this one event doesn't get you into the Christmas spirit nothing will!